Mount Ballard, at 7370 feet, is the official highpoint of southern Arizona's Mule Mountains. Nearby Fissure Peak at approximately 7380 feet might be the true high point of the Mule Mountains, however it's on private property. Unless you are in or good friends with the Wollenberg Family Trust forget it. Obey the law, do NOT trespass. This is a fairly simple ridgeline hike and the route described here runs southwest from Mule Pass near Bisbee to Mount Ballard's summit, following a social (unofficial) trail and a barbed wire fence. Round trip hike from Mule Pass to Mount Ballard: 3.4 miles, 1355 feet of elevation gain, 1520 feet of accumulated elevation gain. Beginning at the parking area at Mule Pass (directly above the highway tunnel), near a white obelisk historical marker, one immediately encounters a fence with a private property sign. Just to the right of the fence and obelisk is a social trail that heads uphill into the trees along a short, shallow drainage. This is the trail you will want to follow. 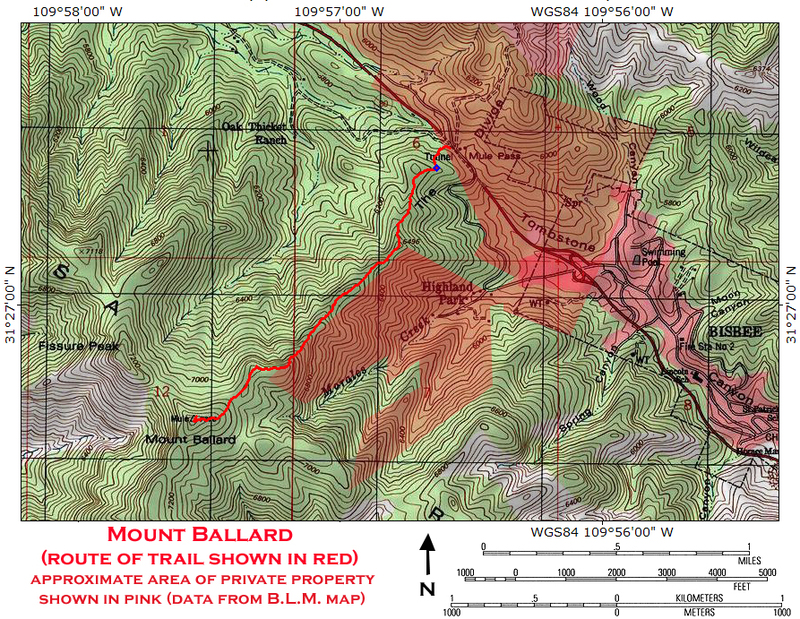 (See map) Please be respectful of the private property in the area so that local landowners do not end up denying access to this route. A tenth of a mile in from Mule Pass, the social trail arrives on top of the ridge, and crosses through a barbed wire fence (6200 feet, 31.45747 N, 109.94388 W). The social trail continues southwest up to Mount Ballard, now paralleling the barbed wire fence, and always staying at or near the crest of the ridge. Open spots among the oaks, junipers, and yuccas allow for some nice views of Bisbee to the east, and of the surrounding area. Along the ridge, a small burn area interrupts the otherwise dense, woody vegetation. Nearing 7000 feet, the ridge turns steep, and the footing becomes challenging on loose, decayed rock. Small cairns begin to mark the route as it crests the ridge's sandstone cap and levels out. The social trail and fence line continue across the rocky northeastern arm of Mount Ballard, among tall cane cholla and junipers. Take note of your surroundings for the return hike, as the trail gets a bit vague in spots. The final 200 feet of Mount Ballard now lie in front of you. The trail heads for the top, squeezing through dense thickets of cane cholla and brush. Close to the summit, there is a nice view to the south down Abrigo Canyon of the Naco area and Mexico, only seven miles distant. At the wooded summit of Mount Ballard, a register is stashed in the bushes. From the top, one can enjoy a view to the west of Sierra Vista and the Huachuca Mountains. To the northwest along Escabrosa Ridge is the nearby, sharp summit of Fissure Peak, its namesake fissure visible as a seemingly out of place scar below the summit.